Dolls House Pets & Garden. Dolls House 1:24 Scale. 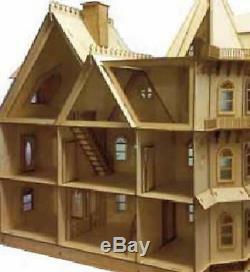 Dolls House Miniature 1:12 Lazer Cut Leon Gothic Victorian Mansion Flat Pack Kit. 1:12 Scale - Flat Pack Kit - Made from hardwood birch in U. Easily assembled - Many detailed features. Detailed porch framing, railings, Victorian gingerbread, corbels, gable ornaments. Width 110.2cm - Depth 49.5cm - Height 139.7cm. 44" x 19.1/2" x 55. Ceiling height 24cm = 9 1/2. SKU: LD005 / Barcode: 8800159427862. Brand: Laser Dollhouse Designs Inc. PLEASE NOTE: These are miniature doll house items and accessories, these are not normal life size items. We cannot be held responsible for any misunderstanding of this fact. Over 3000 Stocked Items With items added every day, you're bound to find what you need! We've got you covered! 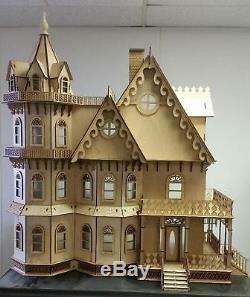 The item "Dolls House Miniature 112 Lazer Cut Leon Gothic Victorian Mansion Flat Pack Kit" is in sale since Sunday, November 15, 2015. This item is in the category "Dolls & Bears\Dolls' Miniatures & Houses\Dolls' Houses". The seller is "melodyw41" and is located in Abergele. This item can be shipped to all countries in Europe, United States.